"Eintracht Frankfurt have won in Rome, Marseille and Milan, so a trip to Lisbon won't spook them." Having finally parted company with the increasingly unpopular Rui Vitoria, who won two Portuguese titles with the Lisbon giants but then slowly lost his grip on things, Benfica had a decision to make. They are believed to have been rebuffed by Jose Mourinho, and considered bringing back the vastly experienced Jorge Jesus. As it turns out, the correct solution was under their noses. Exceptional youth coach Bruno Lage was handed the reins, and has delivered a superb set of results. He has got Benfica back level with title rivals Porto on points (they recently won 2-1 at Porto), he has promoted excellent youngsters like Joao Felix and Gedson Fernandes into key roles in the team, and he has had success by switching the formation from 4-3-3 to 4-4-2. Benfica have won 11 of their last 14 home matches in all competitions, but they haven't been without their hiccups. They lost at home to Moirerense and drew with Belenenses, they were beaten by bitter rivals Sporting in the semi-finals of the Taca de Portugal, and in the Europa League they haven't pulled up any trees in knockout successes against Galatasaray and Dinamo Zagreb. They needed extra time to overcome the Croatian side, and the big question is how drained are they are after playing so many big matches in three competitions? Veteran forward Jonas is suspended, so teenage talent Felix will probably partner Haris Seferovic in attack. Midfield anchor Gabriel is struggling with injury, and his absence would be a big blow. Eintracht Frankfurt won their first major trophy for 30 years last season, as they lifted the DFB Cup by beating Bayern Munich in the final. That success started a buzz in Germany's financial heartland that has grown louder and louder. 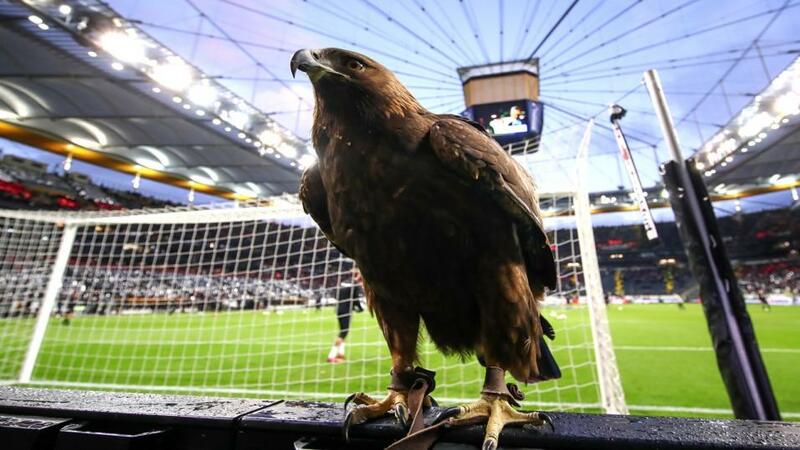 The home games in the group stage were sold out before the draw was even made, and the Eagles have taken thousands of fans across Europe with them. In the Bundesliga, Frankfurt have put together a club-record winning streak of six matches, and are on course to qualify for the Champions League for the first time ever. Coach Adi Hutter has done a wonderful job of adding flair and a clever transition game to a solid base that was bequeathed to him by his predecessor Niko Kovac. In attack, Luka Jovic - ironically on loan from Benfica, who never quite believed in him - has sparkled. His 99th-minute, match-winning penalty at Schalke on Saturday was his 17th goal of this Bundesliga season, and he has netted seven times in the Europa League, including the winner at Inter in the last 16. He has been given wonderful support by Sebastien Haller and Ante Rebic, while wing-backs Filip Kostic and Danny Da Costa have had exceptional campaigns. Given that Frankfurt have won in Rome, Marseille and Milan, and that they are still unbeaten in 2019, they seem too big for the win here at [3.3]. Benfica have made big strides under Lage, but they haven't hit top gear in either the Champions League or Europa League this term, and I wonder if they may be a little distracted by their title tussle with Porto. I'll back Frankfurt Draw No Bet at [2.4]. Eintracht Frankfurt have been goal machines this season, but their tie against Inter showed they can be circumspect and control games at this level. There was only one goal across two legs of that tie against the Nerazzurri, while Benfica's last three matches in the UEL have seen an Under 2.5 Goals bet land. Frankfurt have conceded just one goal in their last six competitive games, and Benfica won't want to take early risks against such a good counter-attacking team, so backing Under 2.5 Goals makes sense at [2.0].